Did you ever find yourself in a situation where you really wanted to show all of your friends and family some pictures or video but couldn’t because you don’t have the proper equipment? Then this project is definitely for you. It will allow you to project anything you want on a blank wall whenever you want to, and it will more than likely allow you to do that for free. We will teach you how to make a HD Film Projector using Smartphone & Shoe Box, which we bet you own already. All you will need is a smartphone, a shoe box, a magnifying glass and a knife. You will want to use an old shoe box for this, because you will need to rebuild and cut the sides to accommodate your magnifying glass, so there will be no other use for it afterwards. 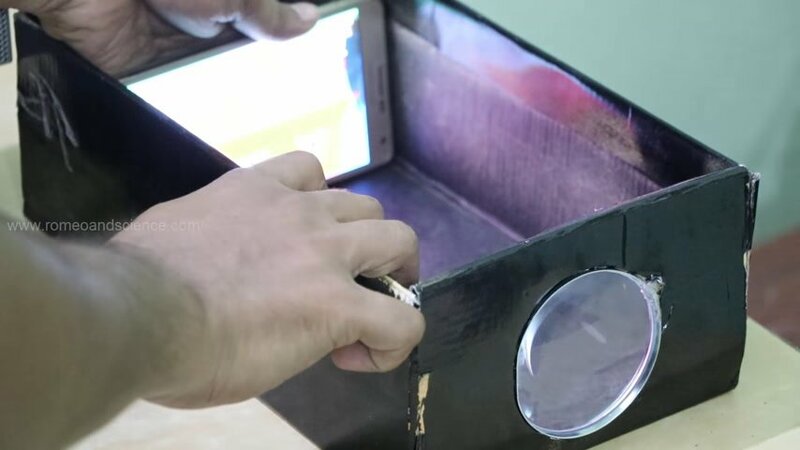 Once you’ve built your projector by taping the magnifying glass to the opening and painting the whole box black – apart from the glass, of course – all you need to do is place your phone inside, replace the lid, dim the lights and start the show!